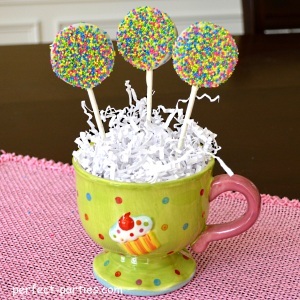 Chocolate Covered Oreo Lollipops decorated with sprinkles to match your party theme. Dip Oreos in chocolate and sprinkle with colors to match your party theme. You can use small candies to add more decorations. Spoon for mixing chocolate and covering oreos. Separate oreo halves and place on lined pan. Using a lollipop stick, press into the cream filling to form a crevice. 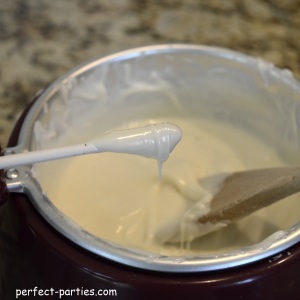 Dip lollipop stick into the chocolate and coat with a generous amount and then place the lollipop stick onto the cream. Put the other half of the oreo on top. Let set until secure about 15-20 minutes. Place in refrigerator for 15 minutes for faster setting. If it doesn't set, it will fall apart when dipping. 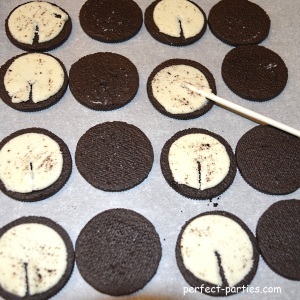 Dip oreo into chocolate by holding onto the stick. Using a wooden spoon coat all sides of chocolate and gently tap the stick on the edge of the pot to remove excess. Decorate with sprinkles of your choice. If you are using small candies, press those gently into the chocolate before adding sprinkles. 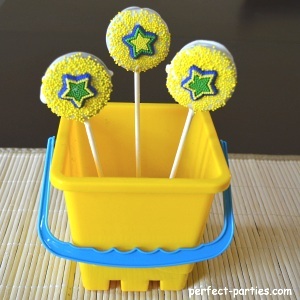 Use cute decorating candies like these Wilton Icing Decorations. They can be used for cakes, cookies, cupcakes and treats like this. You can find them on Amazon and stores like WalMart and craft stores in their icing department. Below is a Hello Kitty decoration from Wilton. 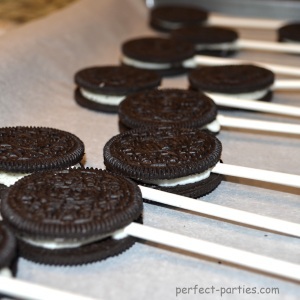 Be sure to let the oreos set with the sticks before dipping or they may fall apart. Extra chocolate? Dip other fruit such as strawberries, or dried apricots.